RAWALPINDI: Pakistan Army denied claims by Indian army of conducting 'surgical strikes' across Line of Control (LoC) and said there had been cross-border fire which was befittingly responded. Director General Military Operations India, claimed to have carried out "surgical strikes" along the de facto border with Pakistan. "Some terrorist teams had positioned themselves at launchpads along the Line of Control," he alleged. 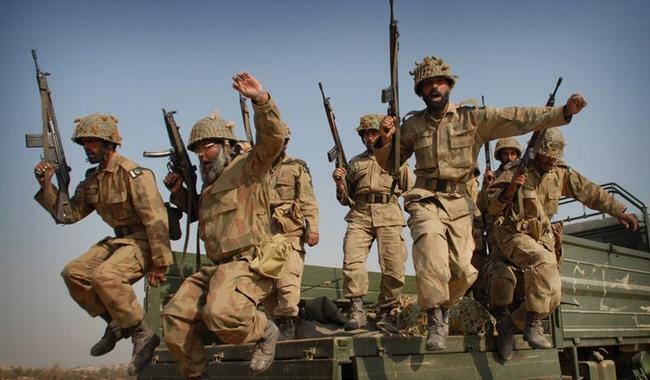 "The notion of surgical strike linked to alleged terrorists´ bases is an illusion being deliberately generated by India to create false effects," the ISPR said in a statement. The statement was released shortly after a senior Indian military officer said India had hit suspected militants preparing to infiltrate. Defence Minister Khawaja Asif told media that Indian government is trying to calm down its people and media by resorting to such aggression towards Pakistan. Earlier, the ISPR confirmed that two soldiers embraced martyrdom due to unprovoked firing by the Indian Army along the LoC. Indian forces opened firing in Bhimber, Hotspring, Kel, and Lipa sectors, which was befittingly responded by Pakistani troops, it said. Exchange of fire which started at 02:30 am continued till 08:00 am, it stated. PM Nawaz Sharif condemned the "naked aggression of Indian forces" in which two soldiers were martyred. A statement from the PM Office said the military was capable of thwarting "any evil design to undermine the sovereignty of Pakistan". The Foreign Office rubbished Indian claim of a surgical strike into Pakistan saying such falsified concocted and irresponsible statements can only escalate the fragile security situation in the region. We can assure India that any such aggression will not go unanswered or unpunished, the FO said in a hard hitting statement. It [India] is trying to make fool of its own people and the international community, it stated. Such falsified concocted and irresponsible statements can only escalate the already fragile security situation in the region especially in the wake of the Indian brutalities and war crimes in the Indian Occupied Jammu and Kashmir, it added.